Many new cylinders have anti-bump feature built into them; however there are still a lot of homes that rely on standard budget cylinders which have little or no protection! 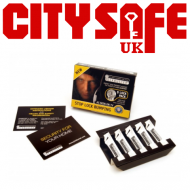 CitySafe UK stocks the solution – Pickbuster®! 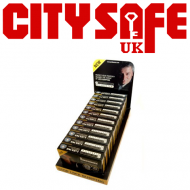 It is a specially designed solution which provides a cheap upgrade to existing cylinder locks to protect them from lock bumping. 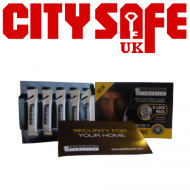 The Pickbuster® solution comes in a sachet which fits into the key entrance of a cylinder and is available to as a 5 Lock Sachet Pack, 5 Lock Sachet Twin Pack or a 5 Lock Pack Display Case!